Pioneer Works venue is located in a desolate and largely unimpressive looking area of Brooklyn (despite being quite a beautiful space). However, on this night, the place was packed. 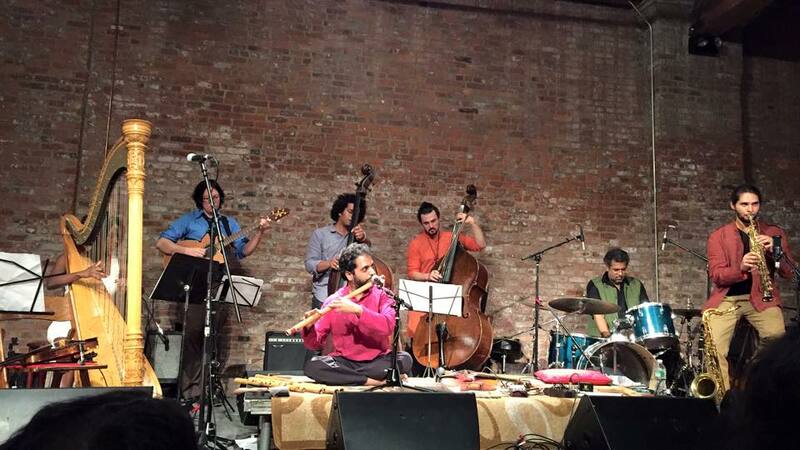 The musicians from the Brooklyn Raga Massive, led by Sameer Gupta, convened at Pioneer Works to honor the memory of John Coltrane on his 89th birthday. 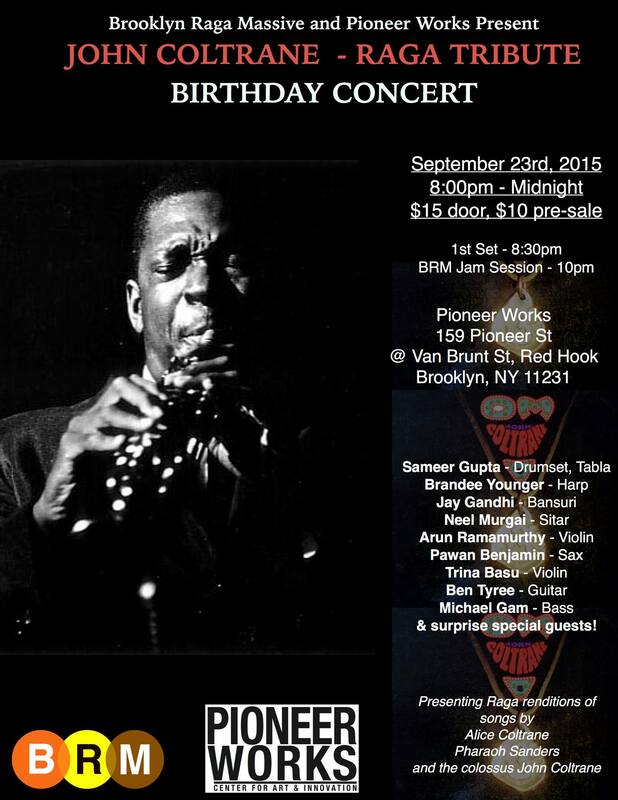 The music chosen for this concert was confined to two specific elements of the vast Coltrane legacy; his own homage to and use of Indian classical music, and Coltrane’s infusion of his spiritual beliefs into his music. Compositions by his wife Alice, and former side man Pharoah Sanders were also included. 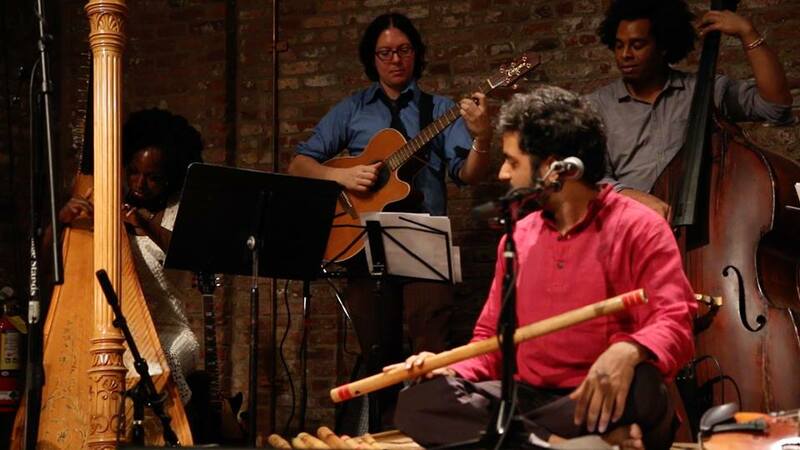 The main band consisted of Sameer Gupta (drums), Arun Ramamurthy & Trina Basu Ramamurthy (violins), Jay Ghandi (bansuri), Brandee A. 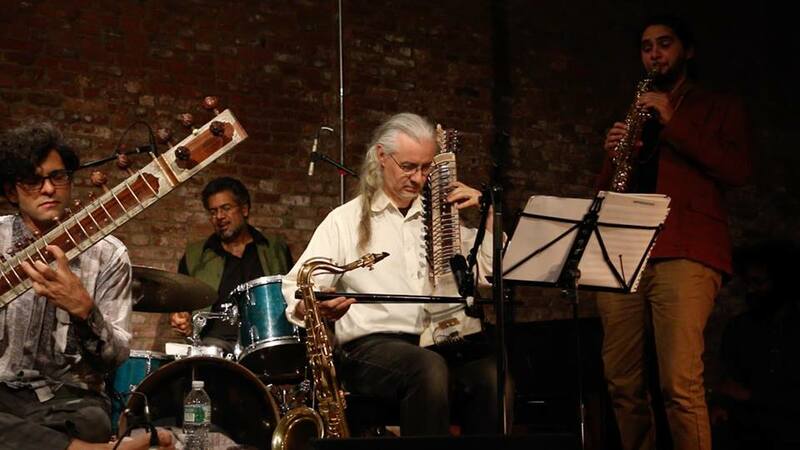 Younger (harp), Ben Tyree (guitar), Pawan Benjamin (saxophones, flute, & clarinet), Michael Gam (acoustic bass), and Rahsaan Carter (electric and acoustic bass). Throughout the night, many great musicians joined them. 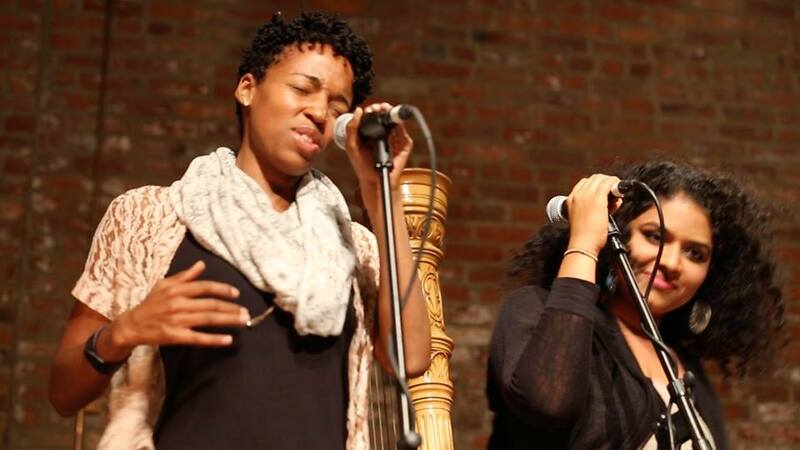 They began with Alice Coltrane’s “Blue Nile.” Lush sounds filled the space, producing an atmosphere of pure beauty. 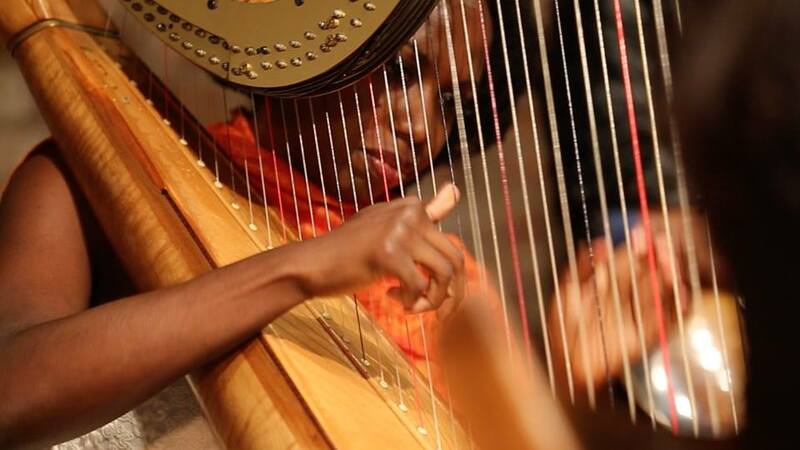 Younger’s harp solo paid homage to, and invoked the musical spirit of Alice Coltrane. They played the head at the end with sublime harmonies and counterpoints. Sitarist Neel Murghai joined them for another Alice Coltrane song; “Journey in Satchadananta.” Arun Ramamurthy took a violin solo that was breathtaking. 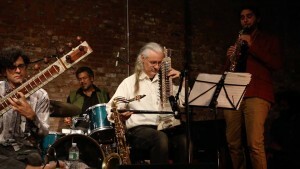 Murghai’s approach blended his own style into the traditional “jazz” workings. He bridged raga and blues nicely. Tyree took this concept further with a jazzy, Hendrix infused solo. “Alabama” was next. Sarod master Anupam Shobhakar joined them. This song needs to be treated with the respect its history and meaning deserves, and they met this challenge easily. 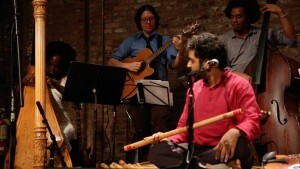 After the head, the song was interpreted as a raga. Shobhakar‘s, Ramamurthy‘s, and GhandI’s solos were beautiful and heart rendering beyond description. The raga blended back into jazz to form a symbiosis of the two classic, and hitherto dissimilar concepts of music. I had the honor of joining them, playing dilruba on “India.” Gam and Carter began the piece as a bass duet, and after establishing the groove, the band came in. At this point, I feel I must resist the temptation to invoke my earlier experiment with music journalism by writing a review offering a perspective from the stage. Suffice it to say that it was a truly joyful experience, and a great honor to share the stage with these magnificent musicians. An idyllic and poetic version of “Naima” was next. On this song, the musicians didn’t merely play the song, they make love to it. 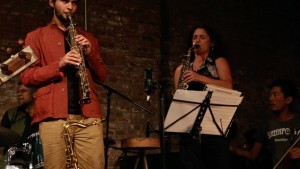 Benjamin played clarinet on it, and added an element of beauty that not only expanded the timbral range of the song, but insinuated the clarinet’s place in Indian music. The ensemble followed this with “Africa.” Kensuke Shoji on violin and Jessica Lurie on tenor saxophone brought out the power inherent in the composition, and the combination of western and Indian instruments added an interesting dimension to the big band arrangement. Ramamurthy’s violin solo was marvelous. There were moments where the “free” element came in (all too brief for my taste: I’d like to have heard what Indian raga training could do in a free jazz context): and hearing it on Indian instruments is quite an experience. “Central Park West” was next. Ghandi played the head and solo on this. He is an amazing musician in that he can produce any music he wishes on what is essentially a bamboo tube with holes drilled into it. Younger‘s addition to this (and everything that was played tonight) added an unspeakable beauty and transcendence to the music. The violin duet of Arun and Trina Basu Ramamurthy held court on “Turia and Ramakrishna.” The Ramamurthy duet, and GhandI’s solos were exquisite. As I sat to the side of the stage during this, it was difficult to take notes because the music brought tears to my eyes. The rhythm section of Gupta, Gam, Carter, and Tyree consistently propelled the music, and underscored and complimented everything that was happening. Listening to Gupta (and playing with him, for that matter) is a fascinating experience. The totality of an amazing spectrum of musical influence flows easily from whatever instrument he is playing. Tyree’s guitar work on this night was perfect for what was happening. Gam and Carter demonstrated that Ornette Coleman knew what he was doing when he put two bassists in his band. They complimented each other beautifully (without sacrificing their individual qualities). The set was ended with “The Creator Has a Master Plan.” Vocalists Rupa Mahdevn and Pyeng Threadgill joined them on vocals. Both women brought two very different vocal styles to the table, yet they blended beautifully with each other and with the band. Naturally, the band was all charged up, and the song became more frenzied toward the end. People in the audience danced, and everyone played with joyful abandon. I truly feel sorry for those who were not able to attend the performance. This was one of those rare moments where amazing musical virtuosity was seamlessly blended with a real community, love of the music, and an immersion in Coltrane’s tradition of using music as a spiritual discipline. This night, the music transcended itself, and the audience was transported to (if I may quote Leon Thomas’s lyrics) “a place where love always shines, and rainbows are the shadows of a love that’s so divine. And the glow of our love lights the sky.” The Brooklyn Raga Massive Orchestra did not merely describe or imitate this; they made it real and manifest. This is what music is all about, and while there are many variations and many levels, ultimately there is no other story to tell. There was a jam session after this (a BRM tradition). Regrettably, I couldn’t stay. As I left, with the sounds of a beautifully executed raga drifting through the empty street, I thought that John and Alice may rest easy: their musical legacy is in safe hands. This entry was posted in Concert And Event Reviews and tagged Brooklyn Raga Massive, John Coltrane, Nu Indian Jazz, Sameer Gupta on September 26, 2015 by Sohrab Saadat Ladjevardi.